Do you need to turn up the comfort and functionally in the kitchen? This Women's Stretch Yoga Cargo Chef Pant is the solution - giving you comfort, quality and value, all bundled in one! No matter what industry you're in or the need for this chef apparel, this pant is well-made and gives you the best value at a competitively lower price. Made of 57% cotton, 40% polyester and 3% spandex; this premium blend of stretch fabric feels and looks good. 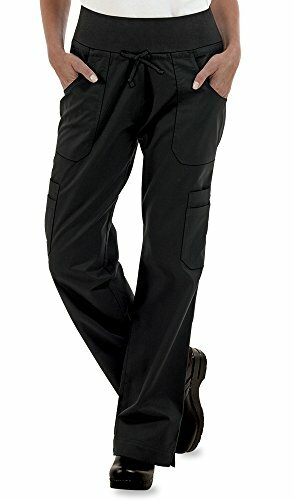 This women's chef trouser has side slits and an adjustable drawcord for a custom fit allowing the ease movement and flexibility needed to take charge in any kitchen, 6 pockets for functionality and storage, and a ribbed waistband with elastic at the top edge creating a look that doesn't get any more professional than this chef pant. To help complete the look of this chef wear or uniform, this pant is cargo styled with a low rise that sits slightly above the waist to easily coordinate with any attire or match any standardized uniform requirement. The approximate inseam length for size Medium (M) is 32". Please refer to the additional product images that contain our size chart and measuring instructions to help determine your best fit. ADJUSTABLE FIT: This relaxed fit yoga chef pant is women styled and fitted for durability and comfort ensuring this pant works as hard as you do without the hassle. This women's chef trouser has side slits and an adjustable drawcord for a custom fit allowing the ease of movement and flexibility needed to take charge in any kitchen. CARGO STYLED: For storage when you need it most, this pant has 6 cargo styled pockets. There are 2 back flap pockets, 2 front pockets, and 2 side cargo pockets with extra mini cargo pocket insets. These are made with food service professionals in mind!